More distractions… a Bunny Bag this time! 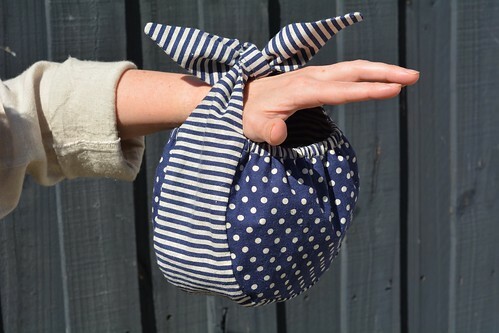 I made this bag as a thank-you present for a friend who helped me get all dolled up for a ball (a black tie function at Miss A’s school) last night. No, I didn’t make my frock. I was a little too scared to make a full length gown in a slinky material! 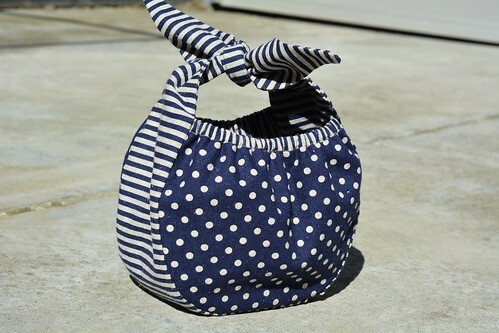 The Bunny Bag by The Maker’s Journal is a fun little project that uses very little fabric. 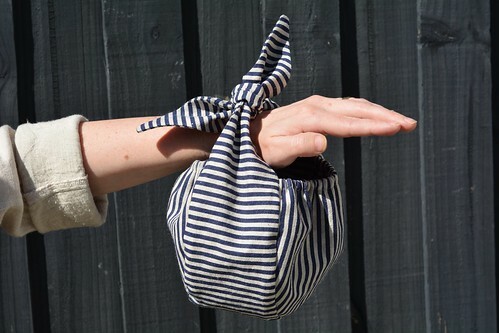 The bag is designed to be worn on your wrist, sort of like a corsage! I wanted the bag to maintain it’s lovely shape (and there is no interfacing used) so I used medium weight cotton/linen purchased as a remnant from from Kelani Fabric Obsession. The fabric is striped on one side and spotty on the other! I used the stripes as the main fabric and the spots are supposed to be the lining. I say ‘supposed to be’ as the bag is fully reversible. I must admit I like the spots/stripe combo best, but it’s always good to have options! The bag comes together quickly… well… that is until it’s time for the hand stitching the handle to the lining. I’m such a slow hand-stitcher. But don’t be put off, the hand-stitching is what makes the bag reversible and in my opinion that is oh so worth it! 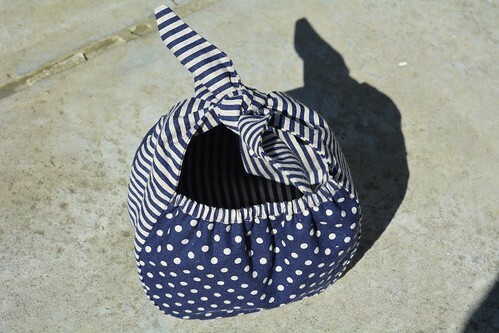 Here is the Bunny Bag happily with it’s new and very happy owner. I think you did VERY well! The spots and stripes are a great combination. A very thoughtful gift. Thanks Anna. There may have been a squeal of delight from the new owner! My youngest daughter (who is very much a girly girly) took a liking to the bag. A pink or rainbow version might be next! Cute bag, the colours dots and stripes made it chic. Would make a great teachers’ day present too! That bag is SUPER cute! But I do still want to see some photos of you all gussied up for the ball! Gosh yes, must download those ball photos. I had enough fabric left over from this bag to cut out one for me with a contrast lining that involves a pop of red. Happy days! Aw that’s awesome! Love those colours and prints together. And it’s the perfect size for a phone+wallet! What a cute bag! I’ll have to add this to my fabric scrap project list. Thanks Kat. So lovely to meet you today. I hope your having a blast at Frocktails!